There was a time when imaginations spawned inspiration. When the mantra, “if you build it, they will come” was virtually fact. When it took hundreds of millions to build a larger than life fantasy resort that would serve to bring illusions of riches and extravagant to reality, if only for the weekend. 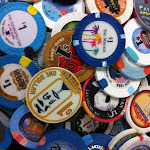 The time just before Bellagio caused people to loose their minds and original thoughts in favor of high end until opulence finally showed IT was what removed Vegas recession proof status. It’s known as the 3rd era of the strip (or the 4th or higher depending on who is telling the story) which, began in 1989 with the opening of the Mirage and lasted almost a decade changing everything until the 4th era began in with the opening of Bellagio in 98. At the beginning of that movement, the Rio was born. 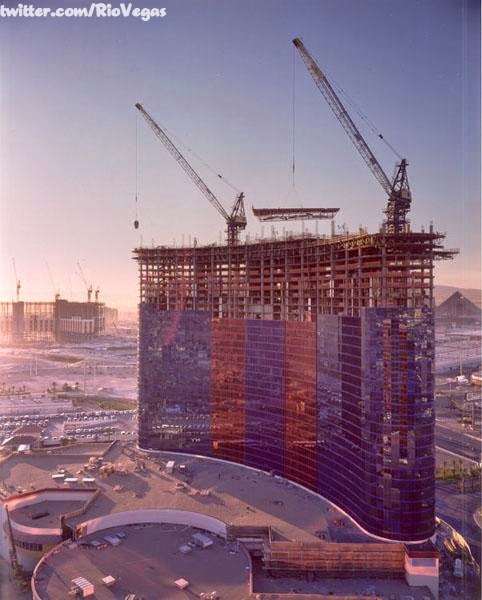 This week’s winner is from @RioVegas for a photo of Ipanema tower being constructed. Whether it was intentional or not, this photo also documents, in the background, the progress on the construction of Excalibur. Watching the reinvention of the strip has to be the closest we will ever get to seeing what it must have been like watching NY build itself skyward. Photographic documentation of Vegas’ evolution will always catch my attention, as this one did.